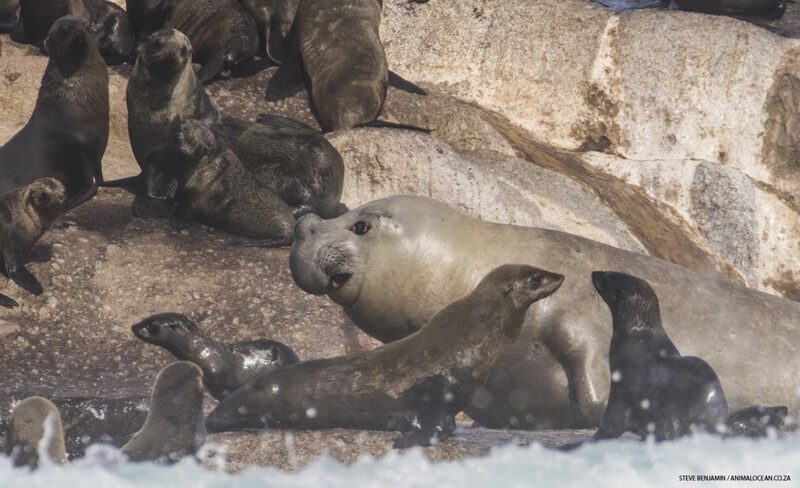 The Hout Bay, Duiker Island, Southern Elephant seal is still hanging around and seems to be taking a liking to playing roughly with Cape Fur seal. The Animal Ocean staff thought that perhaps our visitor would of left after last weeks huge swells, but afraid not. 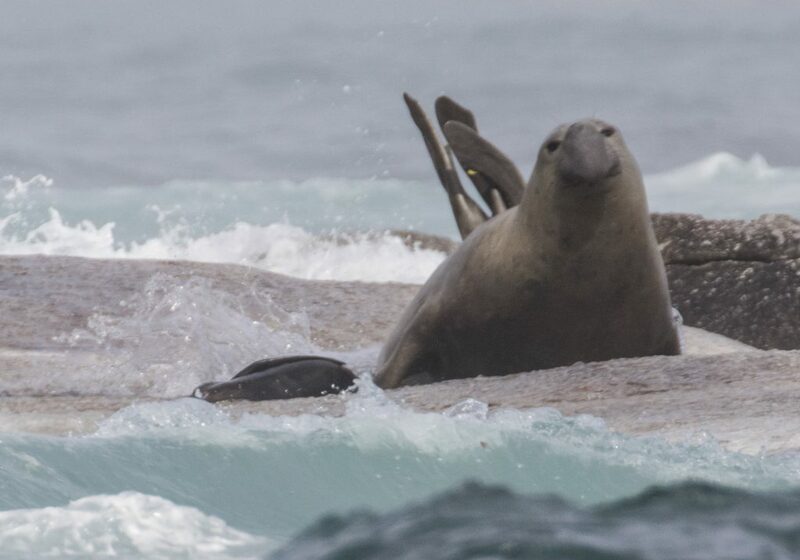 The massive Elephant seal is very happy chilling amongst the Fur seal colony. We have been told by experts that this is a male, due to the bulbous nose structure, and reason for calling it an Elephant seal. 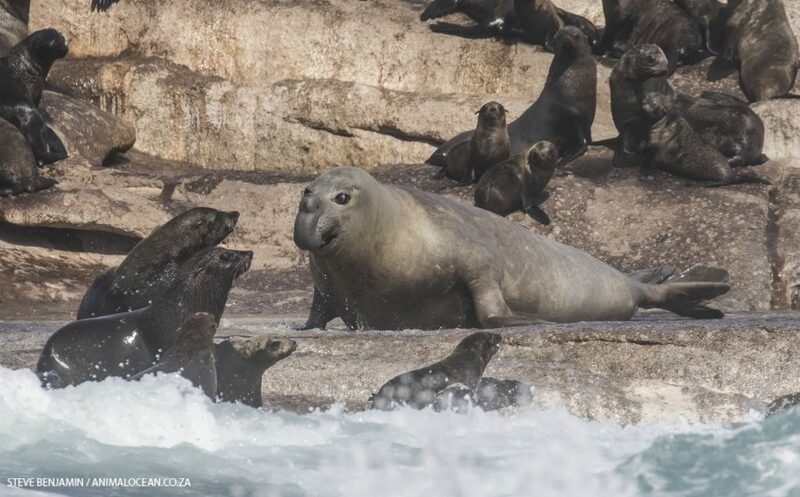 Last week we asked our Facebook family to name this huge seal, here are a few of the suggestions….Shnorkel, Earl, Ferdinand the bully, Leo or Miro (Mirounga leonina), Worsoog, Molly, The Boss, Elvis, Groucho, Mr McGoo, Gobbler, Schnoz. The Animal Ocean staff have call him Malachor – Destroyer of Worlds. The size difference in size and form between our Cape Fur seals and this Elephant seal is only really apparent in these images. Female Cape Fur’s weight around 60kg and the average Elephant seal female is 400-900kg’s with males getting up to 4000-6000kg’s. Another thing you will see on this seal is that his left eye is injured, its one way to know for sure that this is the same individual form last year. Here you can see a glimpse of the tag that is still present in the hind flipper, a yellow tag showing slightly. It my quest to get an image of the number on that tag, which is not easy to do at all. This Elephant seal like’s to sleep and swim in the middle of Duiker Island and just not close enough to get a proper shot. Please go over to Marionseals.com, for great information and images of Southern Elephant seals and all he life on Marion Island.